Suspension: Semi-elliptical independent, two shock absorbers with springs on each side. Now is your chance to have a stylish and collectible Sedan that has all of the performance and comfort features collectors seek in a classic Jaguar. This original single family owned since new S Type Sedan is a Southern California car with original Black Plates and quite a survivor, full of great patina throughout; the Sedan has been well maintained and cared for throughout the course of its life, and comes equipped with an original and Jaguar factory-authorized Coolaire air conditioning system and owner’s manual. In addition, the Sedan's driving experience and handling benefits from a power steering and brake system, and with no shortage of storage space with a huge trunk. The car was recently serviced by Classic Showcase, where it received a full mechanical servicing, which included the installation of a new exhaust system, along with a fresh set of (4) new Vredestein 185/15 tires. 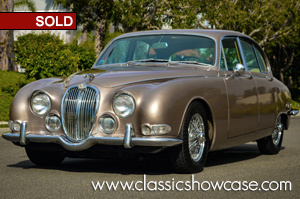 This classic Jaguar S Type Sedan is an excellent choice for the enthusiast or collector who is ready to enjoy a classic daily driver Jaguar model now, or gradually improve and restore as they go along! The Jaguar S-Type was essentially a plusher version of the company's popular Mark 2 but with Jaguar's independent rear suspension, which general layout it shared with the larger Mark X saloon and the E-Type sports car. It shared the monocoque and much of its bodyshell with the Mark 2 including doors, windscreen and bonnet and much of the interior. The rear end was completely restyled around the new suspension and drew styling cues from the Mark X. The S-Type had a slightly revised front end with discreet eyelids over the headlamps, which were not altogether successful in their intended purpose of visually balancing the longer rear end. Heavier than the Mark 2, the S-Type was slower but had a better ride. The 3.8 L engine was the only unit offered in the United States.